Merrell says:"Experience the out-of-the-box comfort you expect from a name like Moab, now with athletic styling and a lighter midsole." The Merrell Moab FST Mid range has been upgraded to the Merrell Moab FST 2 Mid range and the results are pretty impressive. Putting them on for the first time I found them immediately comfortable. Merrell claim to offer extra comfort via their Kinetic Fit Base footbed and I certainly would not argue with that. They are extremely comfortable straight out of the box. Merrell's air cushion technology is embedded into its heel zone and this worked very well at absorbing shock to my heels. The M Select™ FIT.ECO blended EVA contoured footbed offered further comfort and I found these boots to be relatively odourless even after several (rather unseasonably warm) sweaty days in the Lake District's Northern Fells. 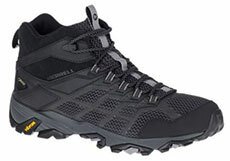 The Merrell Moab FST Mid is a mid-cut boot which means they just about come up to my ankles, but without covering them. I found the 10½'s were true to size. There is only one width available but there are half sizes available from UK6½ to UK12½ and then UK13 and UK14 (but no UK13½). They have a sleeker profile than the original Moab FST's with a mostly mesh upper with leather and thermoplastic polyurethane (TPU) overlays. There is also a Gore-Tex membrane which was very effective at keeping the rain and moisture out whilst allowing my feet to breathe. Furthermore, the bellows tongue did a good job at keeping out any unwanted foreign bodies. The lacing system comprises circular cross-sectional laces and fabric loops up the front of the boot and a single metal locking eyelet at the top either side of my ankle. This system offered lots of flexibility and the locking eyelets provided the facility to keep these boots on and reasonably tight even if your laces become undone. I'm not sure if this is an intended benefit or a potential hazard since you could end up tripping on an untied lace should they come undone without you feeling it. Having said that, the laces did remain fully tied and tight throughout my time wearing them so it wasn't an issue. The Vibram Megagrip outsole has deep 5mm lugs and an aggressive tread pattern which offered a high degree of grip and a good sense of sure footedness on all the types of outdoor surfaces that I tried; grass, rock & mud in both wet and dry conditions. However the soles are not stiff enough to take a crampon and therefore unsuitable for any serious winter walking where crampons and an ice-axe are required. The Merrell Moab FST 2 Mid range combines comfort, style and practicality in a lightweight package. Equally at home on the hill or the High Street they offer a lightweight, waterproof boot for the occasional or novice rambler heading out into the countryside for the first time.